The Venetian Macau plays a crucial role in making Macau one of Asia’s most exciting entertainment destinations. The Venetian is large enough to hold 90 Boeing 747 jumbo jets, as that alone counts for something majestic already. Nowhere else around the world can provide such a rare combination of attractions, facilities and amenities than this marvelous flagship property. The Venetian is conveniently located near the Macau International Airport, the Ferry Terminal as well as the main Chinese border crossing. With 600,000 square feet of gambling space, 3,400 slot machines and over 800 gaming tables, the Venetian is the world’s largest casino that even surpassed its original Venetian counterpart in Las Vegas. The casino is divided into four themed gaming areas such as the Golden Fish, Imperial House, the Red Dragon and the Phoenix. Make sure to take your pick as any of these themed areas might just bring you the luck you’ve always needed. There are 3,000 spacious suites to choose from at the Venetian, either the Royale, the Bella or the Rialto. Each room is big enough for the whole family, even your extended family as well. The hotel’s distinctive split-level suites can help you separate work from play. Bring out your hardworking self and get straight to business with wireless Internet access in the living room or hold a small meeting with your business associates there as needed. But before retiring to the ultra comfortable bed, take time to unwind with your special someone in the suite’s lavishing marble-tiled bathroom complete with a separate shower and bath. Whether you wish to taste the flavor of Macanese cuisine, or if you prefer to have dishes that remind you of home, the Venetian has more than 30 spectacular restaurants that serve anything from International, Chinese, Western or Japanese cuisine. Their unrivaled dining choices remain one thing that visitors look forward to. Their humongous and heavily invested shopping complex remains one of the most prized attractions as the Grand Canal Shoppes go in line with their Venice-themed ambiance. Each and every corner resembles the famous Italian City complete with gondola packed canals located inside the hotel. Guests will also be able to experience the grandeur of the complex by opting to ride in a traditional Italian Gondola through Venetian-style canal replicas as they are serenaded by the gondolier, just as they do in Venice. Need to recharge after that splendid afternoon of shopping with over 350 premier boutiques to choose from? Then head to the Festivita Food Court as they serve a great variety of food from around the world. By night, relax over a few cocktails at the Venetian Bellino Lounge as you listen to some great live music. This 6-star hotel truly combines the timeless romance of Venice with the excitement and glamour that Las Vegas brings. Many claim that the Venetian Resort Hotel in Macau is the best of Las Vegas that was transported to Asia, and may be even better than that. 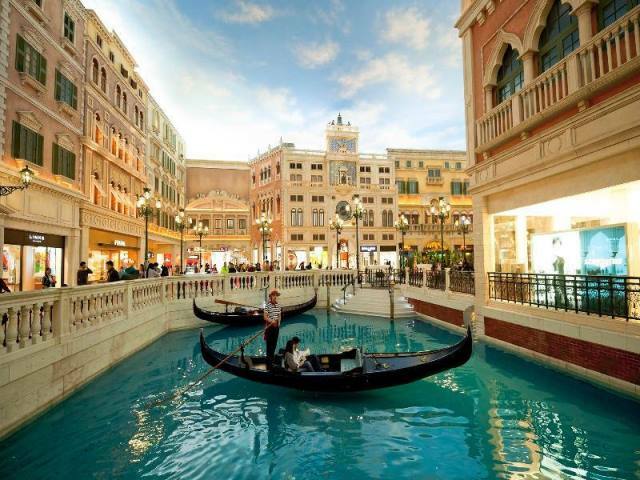 Check out this city within a city and be immersed in the grand Venetian atmosphere of the Venetian Macau.